The aim of this book is to explain and assess the relevance of the ideas of Gramsci to a world fundamentally transformed from that in which his thought was developed. It takes some of Gramsci’s best-known concepts – hegemony, civil society, passive revolution, the national-popular, trasformismo, the integral state - and uses them creatively to analyse features of present-day politics, assessing to what extent his ideas can aid our understanding of the contemporary political world. The book contains essays focused on: aspects of global politics (the development of a global civil society, the validity of the knowledge claims of neo-Gramscian IR specialists and the politics of the WTO and the Alternative Globalisation Movement); contemporary feminism; the problem of adjusting Gramsci’s theory of political agency to modern conditions; Turkish and Israeli politics; and a series of essays on present-day British politics. The book concludes that while there remain considerable problems in applying Gramsci’s concepts to the contemporary world, his political thought still retains an attraction and validity that will continue to inspire political analysts well into the future. 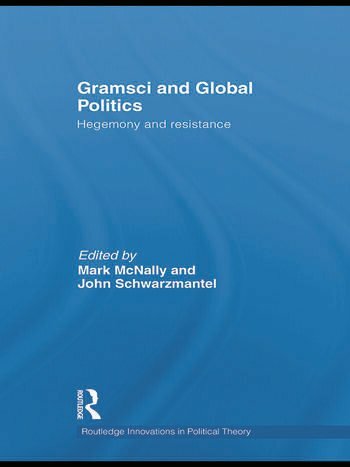 Bringing together a range of essays representing some of the latest research in the field, Gramsci and Global Politics: Hegemony and Resistance opens up new perspectives on Gramsci which will be of vital interest to students and scholars in International Relations and Political Science, Sociology and History. Mark McNally is a Visiting Fellow of Essex University, working in the field of intellectual history, ideology and rhetoric with a primary focus on twentieth century Ireland. John Schwarzmantel is Senior Lecturer in Politics at the University of Leeds, whose most recent book is Ideology and Politics (Sage, 2008).